A dish named in honor of Jean Baptiste Le Moyne, Sieur de Bienville, the founder of New Orleans. Oysters Bienville was created in the late 1930s at one of New Orleans's most famous restaurants, Antoine's. It consists of oysters On the Half Shell topped with a béchamel sauce flavored with Sherry and Cayenne and mixed with sautéed garlic, shallots, mushrooms and minced shrimp. 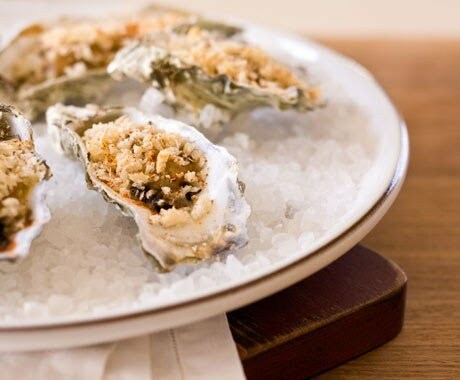 A bread crumb-grated cheese mixture is sprinkled over the top and the oysters are baked on a bed of rock salt until bubbly and browned. Sauté the chopped shallots in the butter and slowly stir over a very low heat until the onions are well cooked, but not brown. Sprinkle the shallots with the flour and cook until the flour begins to brown. Add the chicken broth and the mushrooms and mix well. Beat the egg yolk into the wine and add to the chicken broth mixture, beating all the while. Season with the salt and cayenne, and cook over a low heat for 15 minutes. Heat a pan of ice cream salt in a 400-degree oven for 15 minutes. Place the oysters on the half shell in the hot ice cream salt and return to the oven for about 5 minutes. Spoon the sauce over each oyster and sprinkle with a mixture of the bread crumbs and cheese. Return to the oven and bake until the bread crumb mixture is lightly browned. Two dozen oysters served this way will serve four.